Introduction: Motives for choosing a career are complex, and a choice of dentistry as a career is no exception. It is expected that the person should have some expectations in terms of their future, and the fulfillment of these expectations should give some amount of satisfaction. Aim: The aim was to explore factors influencing dental professional career: Attitudes, perceptions, and motivations. Materials and Methods: A cross-sectional survey was carried out in May and June 2013, among 445 interns working in the dental colleges of Bangalore using a self-administered validated questionnaire. The data were analyzed using SPSS version 18. Descriptive statistics, independent t-test, ANOVA and Pearson's correlation test were used (P < 0.05). Results: The most popular reason for choosing dentistry as a career was to serve people (81.3%). Majority of them enjoyed helping people (92.8%); appeared to be satisfied with their doctor-patient relationship (92.4%); appreciated the independence in the profession (92.1%); aspired to enhance clinical skills (94.2%) and realized the importance of higher education (87%) in the future. Private practice (81.4%) was the most preferred future career plan. Attitudes and perceptions significantly correlated with future career plans (P < 0.05). Conclusion: Service to mankind coupled with autonomy, self-efficacy and inclination to excel in one's own field appeared to influence dental careers in India. In India, students enter dental education following nationwide or statewide competitive entrance examinations. Parental pressure is another factor that plays a role in students' choice of dentistry as a career. Regardless of their reason for choosing dentistry as a career, the expectation of a secure and bright professional future is what keeps most students motivated during the course of their dental education. Apart from this, several other factors such as the academic environment and the dental curriculum also influence students' attitudes. Globally a majority of studies ,,,,,,,,,,,, have explored the motivations of dental students for choosing dentistry, and only a few ,,,, have related these choices with the future. Moreover, such evidence is scant in India. , Hence, the present study was undertaken amongst dental interns in Bangalore. To explore the factors influencing dental professional career using a validated tool. • To correlate interns' attitudes, perceptions and motivations with future career plans. An exploratory study with a cross-sectional design was conducted among 445 interns working in dental colleges of Bangalore. The study was conducted in two phases (survey tool development and data collection) for the duration of 2 months (May and June 2013). Prior permission was obtained from the head of the institutions of all the dental colleges. Ethical clearance was obtained from the Institutional Review Board. This resulted in a 53-item questionnaire, which was a pilot tested for reliability on a sample of twenty dental interns (test-retest reliability α = 0.825); further split-half reliability was also assessed by arranging the questions in odd-even order (Cronbach's α = 0.724). Internal consistency was assessed using inter-item correlation. The list of the dental colleges was obtained from Rajiv Gandhi University and Health Sciences website (www.rguhs.ac.in). There are 16 dental colleges in Bangalore, including one government college wherein students across the country pursue dentistry. Admissions to these colleges are through various competitive examinations. In the present study, all the dental colleges were included. Dental interns present on the day of the study, and those who gave consent were included; there were no exclusion criteria since the sampling method was based on census. Self-administered questionnaire forms were distributed to the interns after informing about the nature of the study, and confidentiality was assured. On average, each intern took about 15 min to complete the form. The forms were then collected and scrutinized for completeness on the day of the study. Demographic information such as age, gender, marital status and educational institution was collected. In addition to this, socioeconomic status was assessed using Kuppuswamy's scale (parent's education, occupation and family income)  the questionnaire comprised of a pretested survey tool with 53-item on a 5 point Likert-scale grouped into four sections. First section explored items (7) that could have influenced their choice of dentistry as a career. The second section consisted of 19 items on their attitudes and perceptions (7: General and 12: Personal) about the aspects of the dental profession. The third section assessed interns' perceptions on the present dental curriculum using 10 items. The last section determined interns' motivation (12-item) and opinions (5-item) regarding future career plans. The statistical analyses were done using the IBM corporation, SPSS Inc. Chicago, IL, USA version 18 software package. Descriptive and inferential statistics were computed. A P < 0.05 was considered to be statistically significant. The 5-point Likert scale was made to a 3 point scale for the ease of the analysis. Strongly agree and agree were considered as agreement; while strongly disagree and disagree as disagreement. The responses according to gender and marital status were tested for a significant difference using an independent t-test. Similarly, ANOVA was performed to test significant differences with respect to socio-economic status. Pearson's correlation test was used to correlate interns' attitudes and perceptions with their future career plans. Out of the 445 dental interns, 71.9% were females, and 93.3% were single [Table 1]. The mean age of the respondents was 23.47 ± 1.5 years (21-38 years); (median/mode = 23 years). 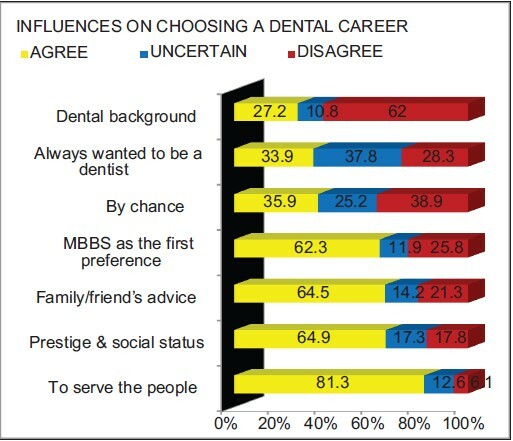 Interest to serve the people, prestige and social status of the profession and family/friend's advice emerged as the most influencing factors on choosing dentistry as a career [Figure 1]. In assessing interns' attitudes, perceptions and personal experiences towards the dental profession: "I am satisfied with my doctor-patient relationship abilities" gained the highest agreement (92.4%), whereas "I do not see enough abilities in myself to treat the patients" was least appreciated (17.8%). Majority of them enjoyed helping and improving appearance of people (92.8%); acknowledged the independence in the profession (92.1%) and were confident in doing dental treatment (91.4%). However, the study participants expressed their discontentment about the current dental curriculum as: "Tedious working hours and busy schedule" (71.7%), "stressful profession" (66.7%), "too long course duration" (62%). Regarding the motivations toward future career plans, most of the respondents were inclined to enhance their clinical skills (94.2%) and realized the importance of higher education in India (87%) [Table 2]. Having a private practice appeared to be the choice of the majority whereas pursuing research projects after graduation hardly attracted half of the future dental workforce [Figure 2]. No statistically significant difference was found between the four sections and gender, socioeconomic status and marital status. Overall, a weak correlation was observed between all the four sections and the future career plans. Working at dental clinic, private practice and entering specialty program abroad significantly correlated with section 1 (influences on choosing dentistry), section 2 (professional aspects of dentistry) and section 4 (motivations toward future career plans) (P < 0.05). Entering specialty program in the country significantly correlated with section 2 (professional aspects of dentistry) and section 4 (motivations toward future career plans) (P < 0.05). Taking a future research project significantly correlated with section 4 (motivations toward future career plans) (P < 0.05) [Table 3]. The goal of an undergraduate course in dentistry is to train students to become ethical, skilled professionals capable of practicing dentistry on a level that is consistent with the expectations of society. Understanding the students' motives for choosing dentistry as a career may aid recruiters in designing appropriate and effective recruitment materials. This may also help in providing students with a complete and accurate picture of the profession. There was no statistically significant difference between the four sections and gender, socioeconomic status and marital status; probably indicating that these variables did not influence the response of the participants. The most important factors influencing the choice of dentistry were altruistic motive (to serve the people) along with prestige and social status. Altruistic motives also served as an influential factor among 81.3% of Iranian  and 44% of Swedish students. Our results are also consistent with the Iranian,  Nigerian  and Jordanian  study where prestige and social status emerged out as the most influential factor. As far as the future career plan is concerned, the majority intended to either start their private practice or work at a dental clinic similar to the Iranian study. Whereas pursuing research was favored by 45.4% of the respondents. Swedish dental students relatively aspired more to become researchers when compared to Japanese (4.7% vs. 1.8%). None of the Canadian (0.0%), some of the Japanese (1.6%) and Thai (3.3%) students wanted to be a researcher in their future. On the contrary, majority of the respondents in the Iranian study were not sure (42.9%). However, uncertainties about the future prospects maybe observed in the responses spread over the five areas of interest. Overall, a weak correlation was observed between all the four sections and the future career plans. Working in dental clinic, private practice, entering specialty program abroad correlated with all the sections except section 3 (perceptions toward curriculum). Hence, it may be reasonably surmised that varied influences on career choice, perceptions and experience during the course will have a significant impact on the oral health in India. Hence, this study has implications for the admission of students to dentistry, their parents, professionalization, institutions, policy makers and professional leaders to understand the motives of the new dentists. 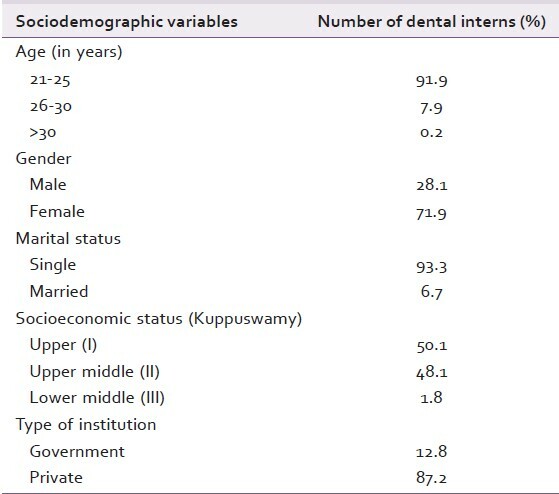 To the best of our knowledge, there is no previous data available depicting the predicament of dental interns in India. The study participants from all the colleges in Bangalore were recruited, thus representing various culture, language and regions across the country. Hence, the results may be extrapolated to the national level. A new research tool was developed after testing for validity and reliability. Since, the internal consistency (Cronbach's α) is well above the recommended 0.7 threshold,  it will, therefore, be a valuable tool for further research in India. Hence, this study contributes substantially to the existing body of knowledge and opens vistas for further research. Further studies may be augmented by a qualitative approach (involving focus group of students and professional leaders) to provide greater insight of the motivating factors and opinions regarding the present dental curriculum. A multicentric study in India which will provide a more representative group of interns should be carried out further. However, there were some limitations to this study. Notably, the self-reported nature of the data (social desirability) could have resulted in information bias. Attitudes and perceptions change over time, subject to opportunities and interests. Hence, periodic as well as long-term surveys are required to capture the dynamic nature of attitudes and perceptions. Overall the interns in the present study exhibited positive attitudes and perceptions towards their future career. 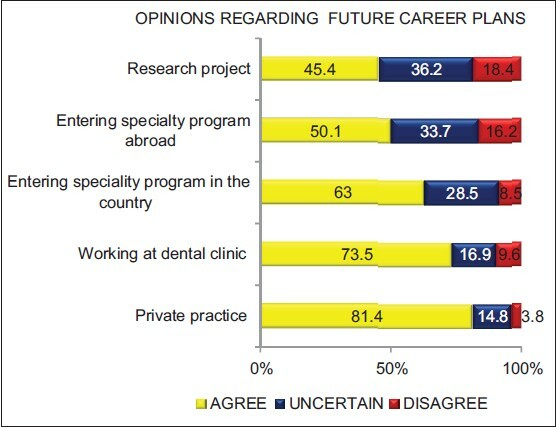 This is reflected in influences on choosing dentistry; perceptions, experiences and motivations toward the future career. Service to mankind coupled with autonomy, self-efficacy and inclination to excel in one's own field appeared to influence dental careers in India. 1. Vigild M, Schwarz E. Characteristics and study motivation of Danish dental students in a longitudinal perspective. Eur J Dent Educ 2001;5:127-33. 2. Sofola OO, Uti OG, Akpene OI. Does exposure to dental education change the perceptions of Nigerian students to dentistry as a profession? Eur J Dent Educ 2008;12:159-62. 3. Baharvand M, Moghaddam EJ, Pouretemad H, Alavi K. Attitudes of Iranian dental students toward their future careers: An exploratory study. J Dent Educ 2011;75:1489-95. 4. Orenuga OO, da Costa OO. Characteristics and study motivation of clinical dental students in Nigerian universities. J Dent Educ 2006;70:996-1003. 5. Al-Bitar ZB, Sonbol HN, Al-Omari IK. Reasons for choosing dentistry as a career by Arab dental students. Eur J Dent Educ 2008;12:247-51. 6. Karibe H, Kawakami T, Suzuki A, Warita S, Ogata K, Aoyagi K, et al. Career choice and attitudes towards dental education amongst dental students in Japan and Sweden. Eur J Dent Educ 2009;13:80-6. 7. Anderson V, Kang M, Foster Page L. First-year oral health and dentistry student perceptions of future professional work. Eur J Dent Educ 2012;16:e166-73. 8. Elangovan S, Allareddy V, Singh F, Taneja P, Karimbux N. Indian dental education in the new millennium: Challenges and opportunities. J Dent Educ 2010;74:1011-6. 9. Aggarwal A, Mehta S, Gupta D, Sheikh S, Pallagatti S, Singh R, et al. Dental students' motivations and perceptions of dental professional career in India. J Dent Educ 2012;76:1532-9. 10. Hallissey J, Hannigan A, Ray N. Reasons for choosing dentistry as a career - A survey of dental students attending a dental school in Ireland during 1998-99. Eur J Dent Educ 2000;4:77-81. 11. Butters JM, Winter PA. Professional motivation and career plan differences between African-American and Caucasian dental students: Implications for improving workforce diversity. J Natl Med Assoc 2002;94:492-504. 12. Dhima M, Petropoulos VC, Han RK, Kinnunen T, Wright RF. Dental students' perceptions of dental specialties and factors influencing specialty and career choices. J Dent Educ 2012;76:562-73. 13. Mariño RJ, Morgan MV, Winning T, Thomson WM, Marshall RI, Gotjamanos T, et al. Sociodemographic backgrounds and career decisions of Australian and New Zealand dental students. J Dent Educ 2006;70:169-78. 14. Scarbecz M, Ross JA. Gender differences in first-year dental students' motivation to attend dental school. J Dent Educ 2002;66:952-61. 15. Bernabé E, Icaza JL, Delgado-Angulo EK. Reasons for choosing dentistry as a career: A study involving male and female first-year students in Peru. Eur J Dent Educ 2006;10:236-41. 16. Gallagher JE, Patel R, Donaldson N, Wilson NH. The emerging dental workforce: Why dentistry? A quantitative study of final year dental students' views on their professional career. BMC Oral Health 2007;7:7. 17. Vahid Dastjerdi M, Mahdian M, Vahid Dastjerdi E, Namdari M. Study motives and career choices of Iranian medical and dental students. Acta Med Iran 2012;50:417-24. 18. Scarbecz M, Ross JA. The relationship between gender and postgraduate aspirations among first- and fourth-year students at public dental schools: A longitudinal analysis. J Dent Educ 2007;71:797-809. 19. Rashid HH, Ghotane SG, Abufanas SH, Gallagher JE. Short and long-term career plans of final year dental students in the United Arab Emirates. BMC Oral Health 2013;13:39. 20. Rashid H, Manoharan A, Abufanas S, Gallagher JE. Motivation for a career in dentistry: The views of dental students in the United Arab Emirates. Int Dent J 2013;63:259-65. 21. Gallagher J, Clarke W, Wilson N. Understanding the motivation: A qualitative study of dental students' choice of professional career. Eur J Dent Educ 2008;12:89-98. 22. Karibe H, Suzuki A, Sekimoto T, Srithavaj ML, Iamaroon A, Warita S, et al. Cross-cultural comparison of the attitudes of dental students in three countries. J Dent Educ 2007;71:1457-66. 23. Lawshe CH. A quantitative approach to content validity. Pers Psychol 1975;28:563-75. 24. Aiken LR. Content validity and reliability of single items or questionnaires. Educ Psychol Meas 1980;40:955-9. 25. List of Dental colleges issued notification for the year 2007-08 subject to the condition. Available from: http://www.rguhs.ac.in. [Last accessed on 2013 Jun 26]. 26. Patro BK, Jeyashree K, Gupta PK. Kuppuswamy's socioeconomic status scale 2010-the need for periodic revision. Indian J Pediatr 2012;79:395-6. 27. Hawley NJ, Ditmyer MM, Sandoval VA. Predental students' attitudes toward and perceptions of the dental profession. J Dent Educ 2008;72:1458-64.